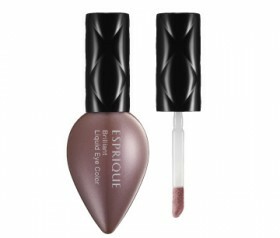 Long-lasting, dimensional eye color with elegant sparkles. Spherical powder in the liquid eye color transforms into a powdery texture that is easy to apply and blend. Compounded with emulsion, it gives a moist feeling while allowing the glitter and pearls to adhere to the skin. Apply 2-3 dots on the eyelids. Using your fingertip and blend the color. Apply the eye color on the inner corner of the eye and the center of the lower eyelid. For the inner corner of the eye, smooth the color upwards as if blending with color A. For the lower eyelids, spread the color back and forth along the edge of the eye.